capital of Ukraine and my native city! In 1240 during Mongol-Tatar invasion Kyiv citizens were trying to find the shelter in this church and save themselves from the enemies. But it happened that together with the people inside it was razed to the ground. No one could imagine that after seven and a half centuries people will still remember the church and its history. At the same time officials try to earn money on its restoration proposing different projects to re-build it. Desyatynna church was built in X and ruined in XIII century. But several centuries later under the patronage of Petro Mohyla it was re-built. The restoration started in 1636 and lasted almost 20 years, it was sanctified in 1654. In XIX century it was a beautiful stone church. Some decades later communists blew it up. Church’s name “Desyatynna” derives from the word “desyat’” which means “ten”. Duke Volodymyr gave 10th part of the state’s incomes to build it. The church was finished in 996. 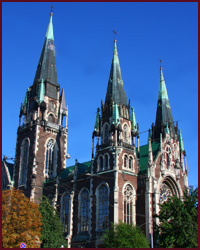 At that time it was named Church of the Assumption of the Blessed Virgin. It was the fist stone church in Kyiv Rus. Different craftsmen and masters from Byzantium were working at its construction. Church was decorated with the frescos, mosaic, marble (and this is just a short poor description from the chronicles). Nobody actually knows how the church looked like back then. It is assumed that it had crosses on its cupolas and had six pillars. It is also considered that the church’s galleries had multiple cupola-crowning but nobody knows how many of the cupolas it had. In his chronicle Nestor writes that there was a school attached to the church. Great duke Volodymyr is buried in it. 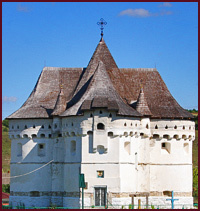 The remains of Great duchess Olha were moved here from Vyshhorod too. Church suffered from the city fire in 1017 and was renovated in 1039. 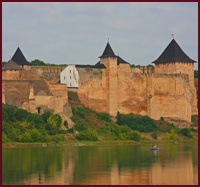 In 1171 it was plundered by the army of Andriy Boholyubs’kyy and in 1203 – of Ryuryk Rostyslavych. December of 1240 became fatal for Desyatynna church. It was the year when Desyatynna church collapsed. Legend says that it just didn’t stand a huge amount of people inside who were hiding from Tatar-Mongol invasion. More credible version is that it was attacked by furious Tatars who rammed the walls and caused the church to fall down. 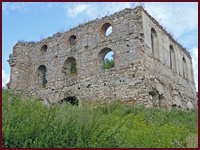 The church was in ruins till 1635 when metropolitan Petro Mohyla ordered to explore the ruins and build the church on them. In 1828-1842 new church is built from stone. The construction is done according to the project of Russian architect Stasov in pseudo-Byzantium style. Though, frankly speaking, it consisted from quite a few Russian-style parts. The church which was an alien among the architectural assembly of Kyiv was closed in 1920. Archeological museum was considered to be placed here. But it didn't happen as in 1935 Desyatynna church was demolished..
Nowadays in this territory one can only find the remains of the church's foundation. I have a strong opinion that the foundation of the church on the Old Kyiv hill cannot be disturbed. We do need to remember that there's a thick layer of different cultures lying below in the hill. If the construction will be started, it will be destroyed forever.